Here’s the tentative line-up for this weekend’s broadcasts (plus a reminder of Saturday’s AlphaGo keynote), subject to change (we’ll keep you posted on Facebook and Twitter). Presented here is the answer to the 4th tsumego from Michael Redmond 9P’s coverage of the challenging tsumego problems featured at the 2016 pro pair go tournament. Michael mentions that the author of this tsumego, Oba Junya 7P, is well known for his pro level tsumego problems. There’s room for up to 48 players to participate in Tuesday’s Team Relay Go. Sign up at the ‘Events Sign Up Table’ next to Registration on Saturday, July 30, or email ritter.neil@gmail.com before midnight Monday, August 1. “This new event is only possible because of the professional players who have volunteered to be team captains,” notes Ritter, extending thanks to Mingjiu Jiang 9P, Feng Yun 9P, Yilun Yang 7P, William Shi 1P, Andy Liu 1P, Eric Lui 1P, Calvin Sun 1P, and Ryan Li 1P. 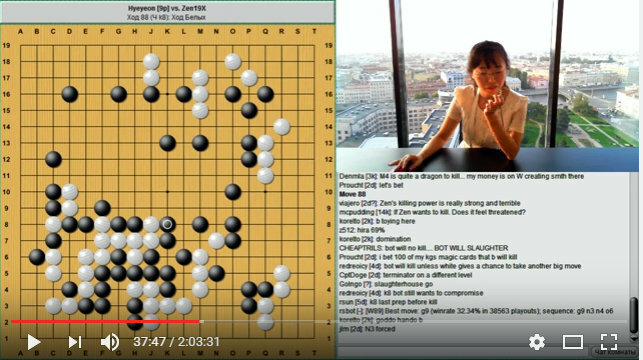 Zen Defeats Top Pro Cho Hye-Yeon 9P: Wednesday, July 27, 2016 became another historic date in the rapidly- developing history of computer go. Cho Hye-Yeon 9P, one of the strongest female players in the world, lost to the go playing program Zen in a two-stone handicap game. 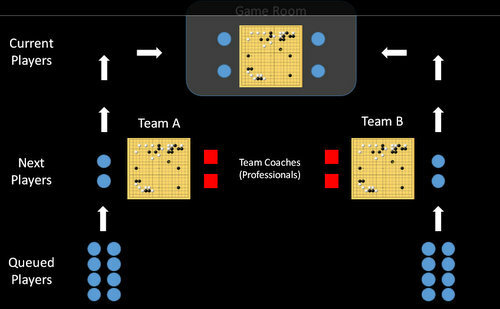 Unlike AlphaGo, which only a select few have had the chance to play, Zen bots can be easily found at KGS go server and have been seen in many computer go tournaments. Cho Hye-Yeon tried to play an active fighting style against Zen but the program calmly brought in the 1.5-point win. Click here for a video of the Cho Hye-Yeon game and her comments. 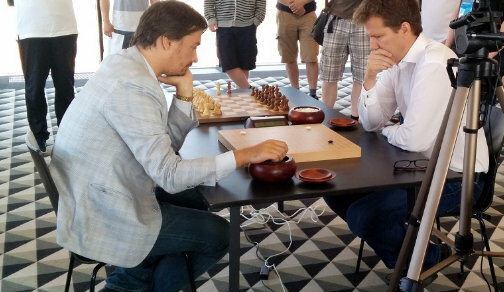 Morozevich Bests Hillarp Persson in Go/Chess Match: The Go/chess match between Alexander Morozevich and Tiger Hillarp Persson was the spotlight of yesterday’s EGC program, with live coverage on the official Russian Go federation YouTube channel. 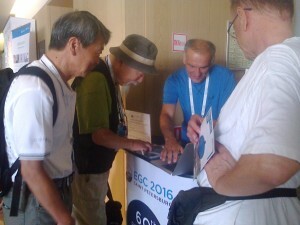 The chess games were commented by Grandmaster Vladimir Fedoseev and the go games by Wu Hao 2P (China) and Alexander Dinerchtein 3P. Alexander Morozevich lost only the last go game and won the match 3-1. After the match he gave a chess simul where he lost only one game, to a German FIDE master Mike Stolz (2319 chess rating, 7kyu in go). Alexander Georgiev, several-time Draughts world champion, came to see the match and play the simul. 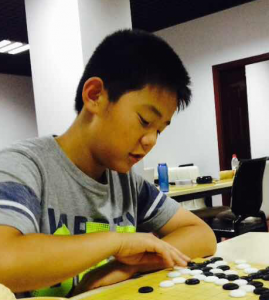 He is a beginner at go too but plans to study the game. 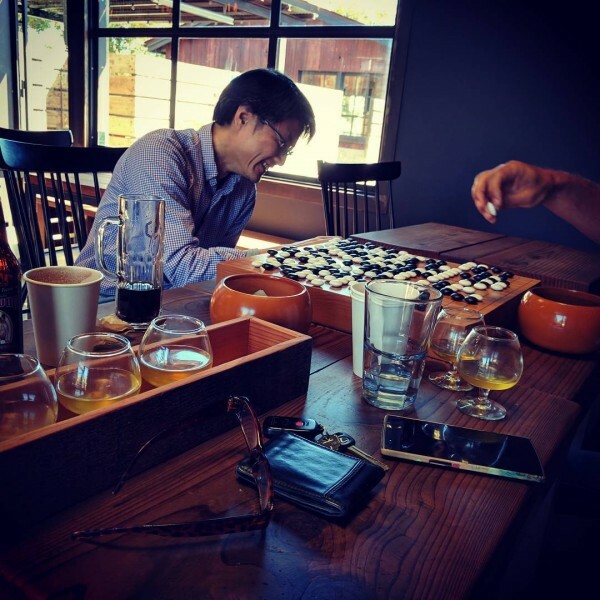 Ed Lee sent in this great shot of “Me playing go with my friend Blake Haber. The place is Third Window Brewery in Santa Barbara, CA, where they brew and serve their own beers. I drink only root beer but today I tried a latte from a new coffee stand there. Got go photo? Send ‘em to us at journal@usgo.org! With congress right around the corner, the 2016 finalists for the Redmond Cup are gearing up for the championship matches. The first match of both the Senior (under 18) and Junior (under 13) divisions will be broadcast on KGS, Sunday 8/1 at 3 pm EDT. 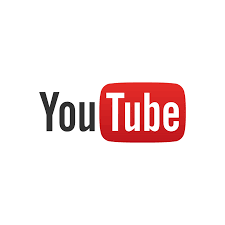 The Senior Division Finals will also be live-streamed on the AGA’s Youtube channel with professional commentary from Jennie Shen 2p and Lionel Zhang 6d. Tuesdays match will be commentated by Stephanie Mingming Yin 1p and Michael Chen 8d, if there is a third round in either division, Gansheng Shi 1p and Andrew Lu 7d will comment live on Thursday. The player profiles below will help EJ readers know who is who. 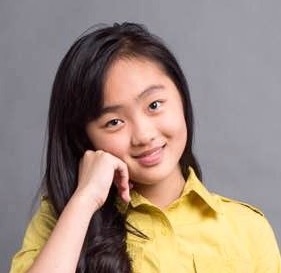 Luoyi Yang 4d, age 12 is from Toronto, Canada, and placed first in the Junior Division preliminaries this year. 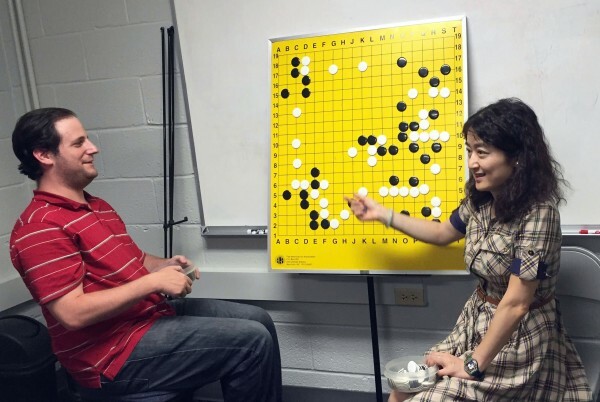 She started playing go at the age of 4 at a local go school in China, where she studied with Ding Lie 6p, Wang Xiangyun 2p, and Wang Chenfan 4p, two afternoons a week before moving to Canada this past year. Outside of playing go, she enjoys playing the piano and singing. Ary Cheng 4d, age 10, lives in Sunnyvale, California, and is the defending champion in the Junior Division. 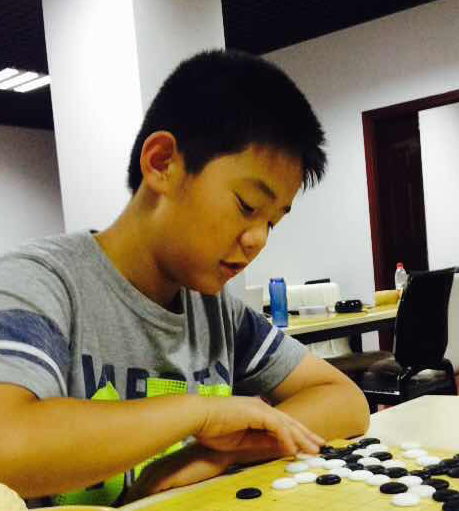 He started learning go at age 6 in a go class at a Chinese school, and was immediately drawn towards the game. 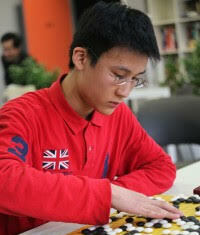 Currently, he studies with Mingjiu Jiang 7p, and plays on IGS in addition to doing tsumego. When he is not playing go, he also enjoys playing table tennis. 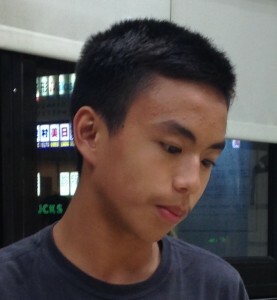 -Justin Teng, Redmond Cup TD. Photos courtesy of the players. Presented here is the 4th tsumego from Michael Redmond 9P’s coverage of the challenging tsumego problems featured at the 2016 pro pair go tournament. Michael gives the detailed solution tomorrow. Elections for three regional and one at-large American Go Association board seats close July 30. Each full member and chapter should have received their ballots for an online voting site through their AGA email on file. Any questions contact elections@usgo.org.